July is ending and we continue to endure extreme temperatures. This is affecting the farm by stressing out the plants (and the farmers!). 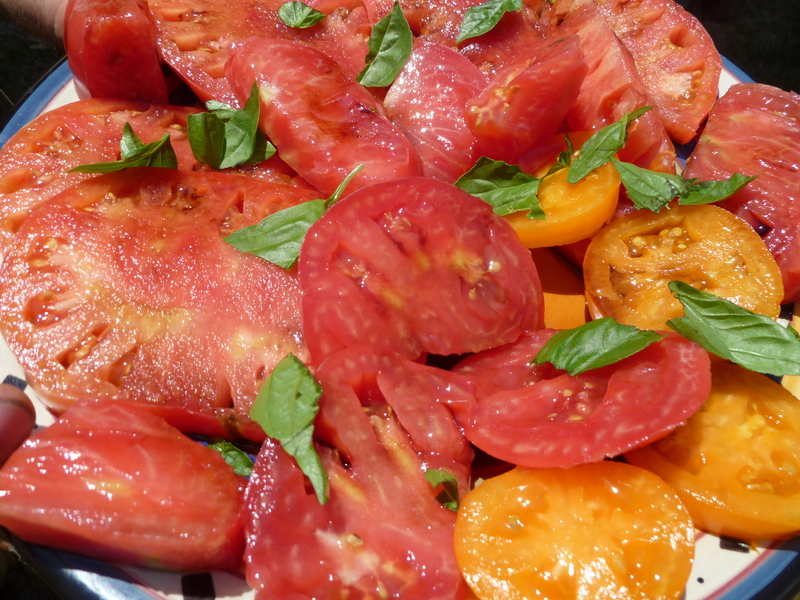 We are proud to offer our first slicing tomatoes of the summer. We know you love them, so we planted plenty. 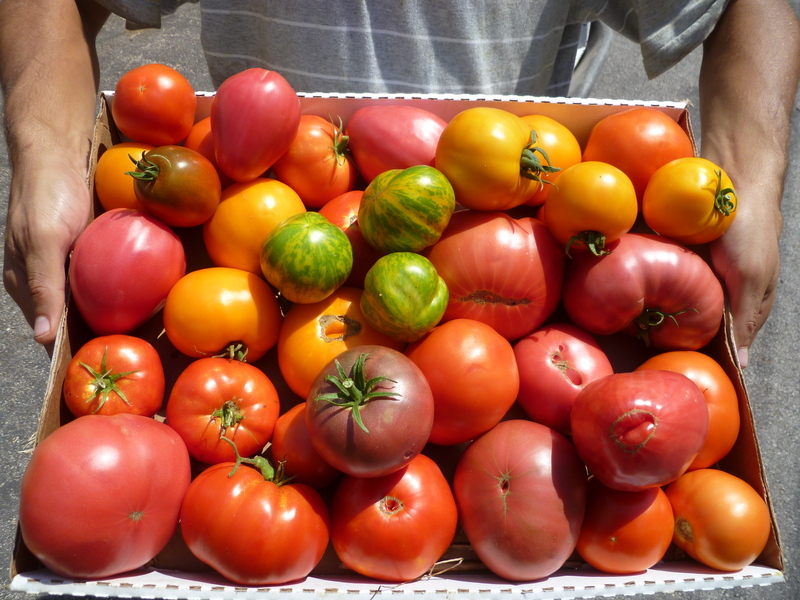 Some of the heirloom varieties you may receive this week are Ox Heart or Cherokee Purple. Cherokee Purple is one of our favorites and it is at its peak in flavor and texture when it still has green “shoulders” (the area around the stem). The flesh has a slightly purple tinge and it has a refreshing acid flavor. Capture the essence of summer with a salad of sliced heirloom tomatoes, a few basil leaves, a sprinkle of salt, and a drizzle of balsamic vinegar and olive oil. To make your tomato salad into a meal, add some soft cheese like mozzarella and a few hunks of crusty bread. Please refrigerate your cherry tomatoes. A combination of the hot weather, humidity, and rain may cause the sungold cherry tomatoes in your share this week to more easily split open, which lessens their shelf life. The good side is you have an excuse to eat them right away because split or whole, they’re tasty! These are bunched onions grown for their delicious long green tops and harvested whole before the bulb gets the chance to form. Keep refrigerated in a plastic bag and use within a week. Slice them finely and throw in a green salad, or add at the last minute to a stir fry. Keep refrigerated. We’ve topped and rinsed them so they should store for weeks in your refrigerator. These snappy carrots are best served uncooked. is a heat-loving vegetable that hails from the tropics. It hates to get too cold, even after it’s been picked. For best quality, store it above 45 degrees. The center column of your refrigerator is typically warmest. You might keep it there in a plastic bag. Add a crumpled paper towel to absorb excess moisture. Eggplant is tasty when fried in olive oil, but you’ll notice that the slices act as a sponge so don’t add too much oil. This sponge-like quality means the fruit will soak up other flavors in the pan. Simply saute with other summer ingredients like zucchini, peppers and onions. Our favorite way to prepare eggplant is on the grill. Cut into slices and brush with a garlic-infused olive oil, then cook until tender. Take slices off the grill as they are ready, sprinkling each with salt and minced fresh herbs. Grilled eggplant is great in sandwiches or topped with tomato sauce and cheese for a summer version of eggplant parmesan. Keep refrigerated in a plastic bag. Remove the ribs before chopping. Stew slowly with ham or smoked turkey or add to soup. For more good information about how to store your vegetables check out our link at the top of our website: How to Store Your Vegetables: A Guide. Sunday’s rain formed some puddles in the parking lot but didn’t make any mud in the garden. The soil was barely moist to the touch and dusty again by Monday. Despite no substantial rain since April, the crops we have in are doing pretty well under their heavy blankets of straw mulch. Getting seeds started for fall has really been a challenge, even under shade cloth. Dry soil and high heat makes it tough for baby plants to make their way into the world. Please bear with us in early fall as some of the cool weather crops may be a little late coming around! We hope you enjoy this week’s share. Big thanks to Randy for this week’s excellent share descriptions and suggestions.